Feel Better Community Acupuncture is a clinic in Southeast Portland offering affordable acupuncture in a group setting. We use a sliding scale to make acupuncture accessible to more people, regardless of income. Treatments cost $15-$50: you decide how much you can afford to pay, no questions asked. This clinic is a hate free zone. We use a sliding scale of $15-$50 for acupuncture treatments. There is no new patient fee. You decide how much you can afford to pay. No income verification is required. The price you pay does not affect the length of your treatment, the number of needles we use on you, or anything else other than our checking account (and yours!). Anxiety Adjustment: For many people, thinking or talking about money can trigger anxiety. Having to decide what to pay each time causes some people to get a little surge of stress right before their treatment. Yuck! 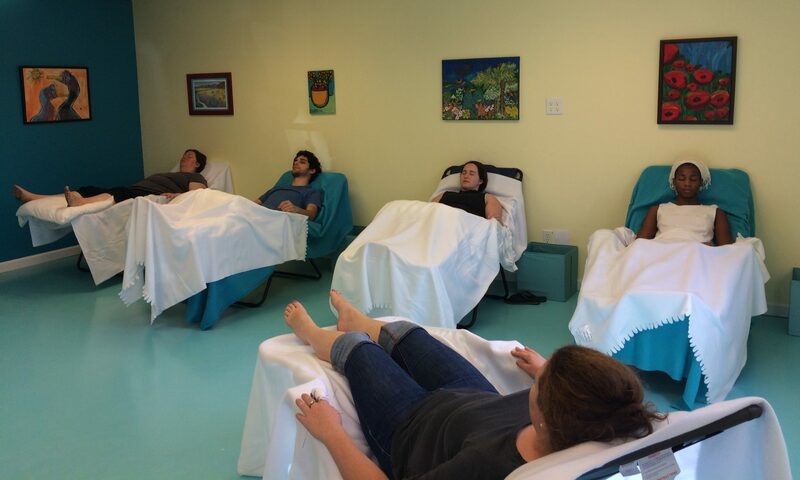 We don’t want to make anyone anxious or stressed, we want to reduce anxiety and stress! If you get an anxiety surge when we ask how much you want to pay, we can skip it. Pick the price you’d like to pay each time, and we’ll note it in your chart so we won’t ask you again. If your circumstances change and you’d like to pay more or less in the future, you can do so at any time, just let us know. We do not bill insurance. If we did, our prices would need to be higher, so this is not going to change. If you have insurance that covers acupuncture, we would be happy to provide you with a receipt containing the proper billing code so that you can submit it for reimbursement on your own. If you need to cancel an appointment, please give us 24 hours notice so that there’s time for someone else to take that appointment slot. Appointments canceled with less than 24 hours notice will result in a $15 cancellation fee. Baker’s Dozen: Acupuncture works best when it happens regularly, and people are more likely to make time for acupuncture if there’s a regular appointment already in their calendar. If you book a series of twelve recurring appointments once a week, we’ll give you a 13th appointment for free that you can use yourself, give to a friend, or donate to someone who can’t afford acupuncture. Note: you do not have to pay for all 12 appointments in advance. Ready to make an appointment? Great! Use this handy form to choose your date and time. If you’d like to come with a friend and want to book for both of you, check the appropriate box under “Add to your appointment” when you are choosing the date of your appointment. We’ll go ahead and block out enough time for both of you without your friend having to set up the appointment separately. For new patient appointments, please arrive 15 minutes before your appointment time to fill in the new patient paperwork. Note: Missed appointments or appointments cancelled with less than 24 hours notice will result in a $15 no show/late cancellation fee.